This worked out well since the last time Cody was here (2007) the Forbidden City was undergoing serious renovation in preparation for the Olympics. We had walked through, but most of the major buildings were covered with scaffolding and tarps. Even though he had been here, he'd never really SEEN it. For my own part, this would be my forth time through... one year I just circumnavigated it on foot. I doubt that the Forbidden City has ever looked better. Renovation had the place sparkling. In addition to a paint job, and the shining and fixing of roof tiles, many of the buildings have had gold leaf re-applied to intricate patterns on the side eaves. There was so much gold that sometimes you couldn't look at it directly due to the reflection. Wait... reflection of what? Today was the single best day I had ever seen in Beijing. The sky was... BLUE?!? It may have been the first time I'd ever seen that here. All of Beijing was bathed in unfiltered, glorious sunlight. Even though I've done the whole photo thing in the FC three times now, I couldn't resist snapping a few under such good conditions. You'll have to look at the photo comments from previous years if you want to know exactly what you're looking at though. 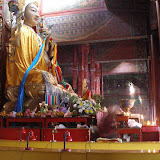 After Forbidden City, we taxied up to Yonghegong Lama Temple (Lama Temples are Tibetan Buddhist). I think this was my third trip here, Cody's first. 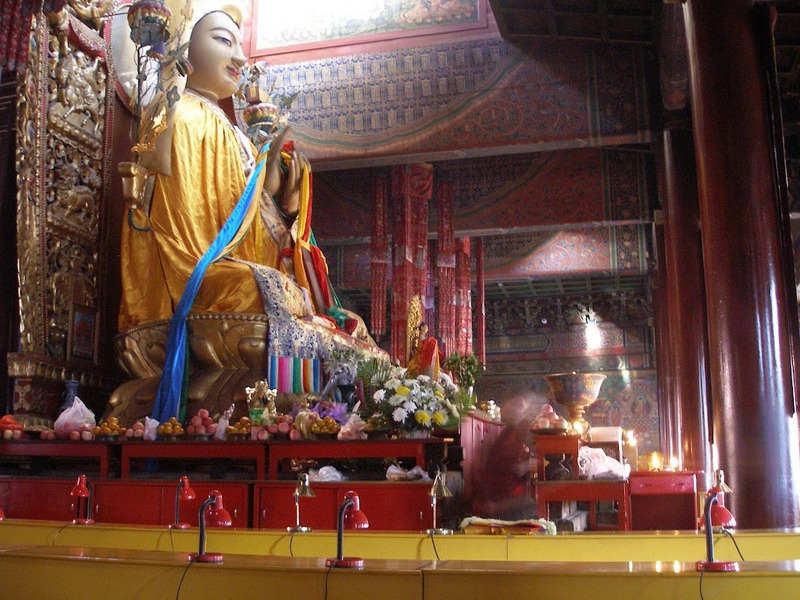 Yonghegong is a beautiful place to visit with some impressive buildings, buddhas and history. It's usually overlooked by western tourists, but not by Buddhists worshippers and monks. It's a very peacefull stop sandwiched in a very busy section of city. After the Lama Temple we returned to our hostel, Kelly's Courthouse, another converted hutong residence. My friend Jinghong met us there later to chat. Jinghong lived in Hangzhou last year but has since moved to Beijing to work. She had already eaten but she walked us to a hotpot place and helped us order, then went to visit another friend in the hutongs. By the time we had finished she had returned. Then she walked us to a Christian bookstore in the Beijing hutongs... a little unusual. She left us after that but Cody and I continued walking the hutings in the dark for a while, seeing what we could. The next day we both left for home.